We took four Antelope with your rifle. Needless to say, I am very pleased with it’s performance. All one shot kills with the 105 Bergers. No huge distances but all beyond my old comfort zone. 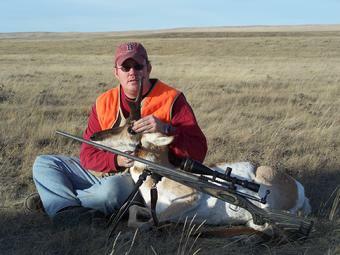 The two doe were 340 and 357. Matt’s buck was 349, and mine was 404 yds. We couldn’t have done it without your help. Thanks for all the time and work you put into my Savage 110 200Win Mag. The recoil reduction, trigger work and accuracy are amzing on such an inexpensive gun. 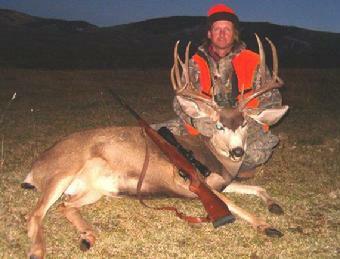 Here are the results of a self guided hunt for mule deer in Colorado that year. 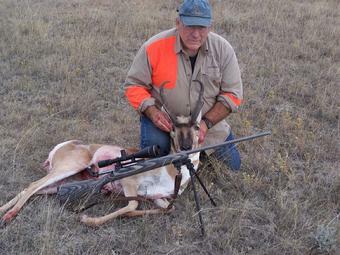 Took this fine muley with unusual whitetail style rack at just over 250 yards, one shot, dropped it in its tracks. I also took a decent whitetail buck at over 200 yards this past year, again, one shot, dropped in its tracks. Had to drop you a line to show you the results of your work on my .300 Weatherby. 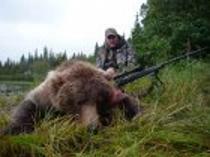 I took this nice Brown Bear in Alaska with one shot from the rifle you worked on. The accuracy you built into this rifle made me confident enough to drop the bear in its’ tracks with one shot. The guide couldn’t believe how fast the bear folded. I guess they like not having to trail them into the brush! Thanks again for some fine work…..